Gone are the days of tinsel, foil ceiling decorations and just Christmas tree's to decorate your home during the festive season, but in are the candles, indoor festive lights and festive snuggle items such as cushions! Sadly, not all of us have the home comforts of a lit fireplace with real coal, however, that doesn't mean we can't make our homes festive and cosy during the Christmas period! Evans Lichfield is a cushion brand like no other, born in the 80s from husband and wife team - Carol and Keith Evans from Lichfield, Evans Lichfield was born. 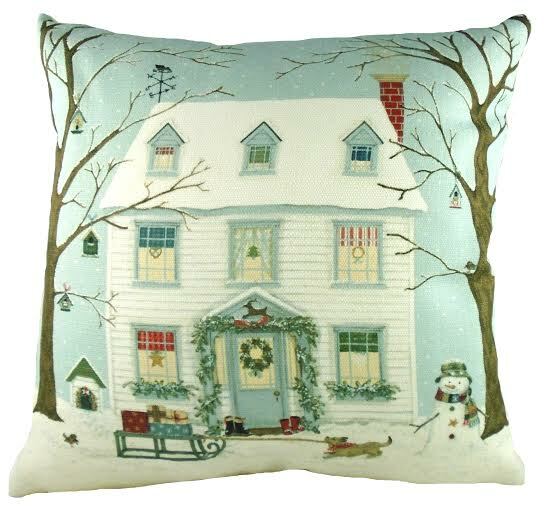 The brand manufacture, wholesale and distribute Scatter Cushions, Seat Pads, Draught Excluders, Throws and more! If you have a theme in mind, then Evans Lichfield are bound to have what you desire. What caught my eye in particular with this brand, was their large range of Christmas cushions, with other brands, you'll find they have a much smaller range, with the typical festive colours, however, Evans Lichfield have more than the basic red festive colour, they do a whole range of variety surrounding the festive period! 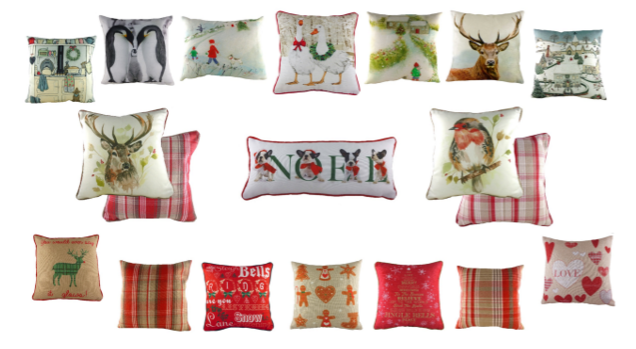 I was luckily asked to sample a cushion for myself, and thats when I hit the task of all task this Christmas, with such a large range, it was safe to say I was like a child in a toy shop! 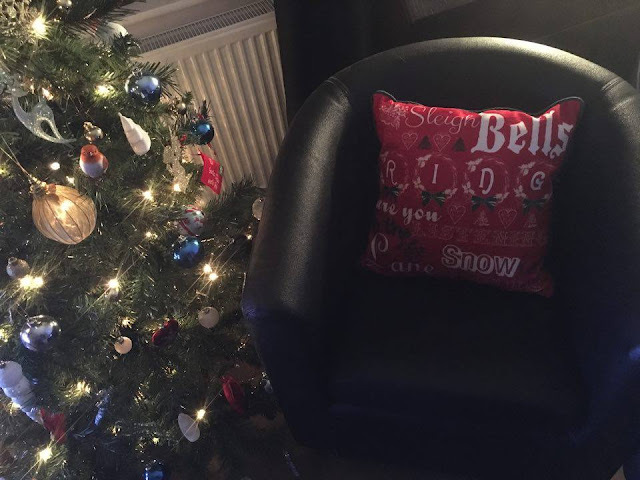 I finally went for the 17'' Sleigh Bells cushion, as I knew it would go well with my Christmas duvet set, and I wasn't wrong! 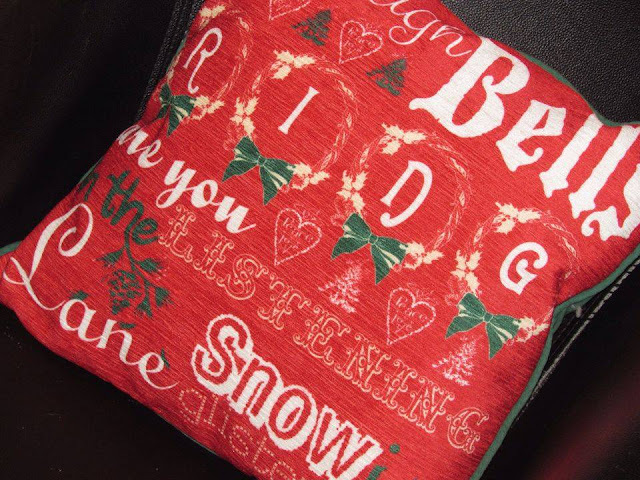 The front of the cushion is red, made from 100% polyester, featuring popular festive lyrics any Christmas fan will recognise: Sleigh Bells Ring, Are You Listening, In The Lane, Snow Is Glistening...... Holding the cushion is a comfort in itself, it's very plump, but soft enough to cuddle and not want to let go, as both myself and Spud have discovered recently! 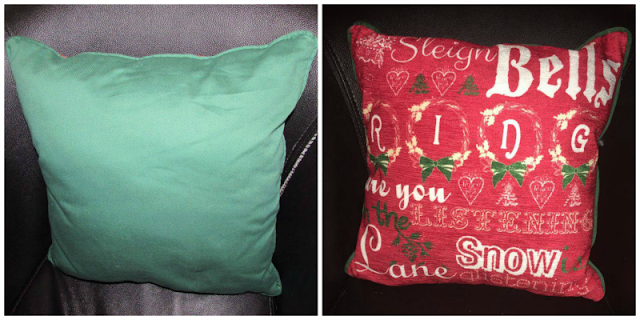 The back is plain festive green, made from 100% cotton, just like the front, it's a pleasure to cuddle up too, and hold onto in them cosy warm festive evenings! I got this cushion for the intention of it to go onto my bed, however, both me and Spud love it so much, it's mine whilst he's at school, and his when he's home! He's even started hiding a note inside the zip at the bottom, to make sure everyone knows it's his cushion as soon as he's home! 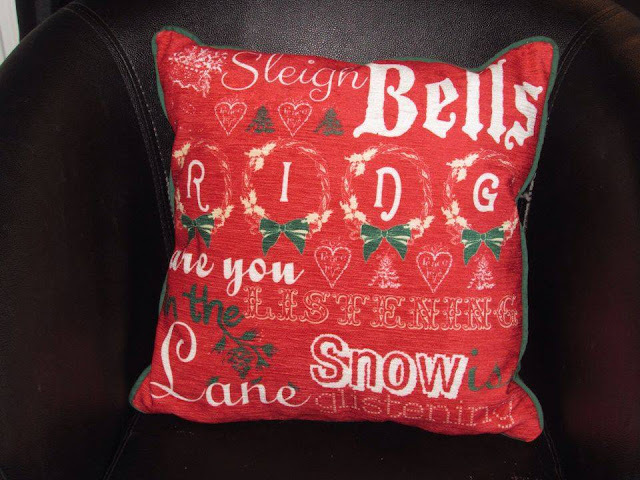 Evans Lichfield have very kindly put aside this beautiful festive cushion designed by Sally Swannell for one of my readers/visitors to win! Sally's a British artist that Evans Lichfield work with, she's an established and successful artist designer, who has been producing beautifully presented images in her striking style for well over 10 years! To enter the competition, simply enter the form via the Rafflecopter form below! Evans Lichfield products are available from independent retailers and high street stores throughout the UK. For further information visit their website here, find them on Facebook here, or follow them on Twitter here.